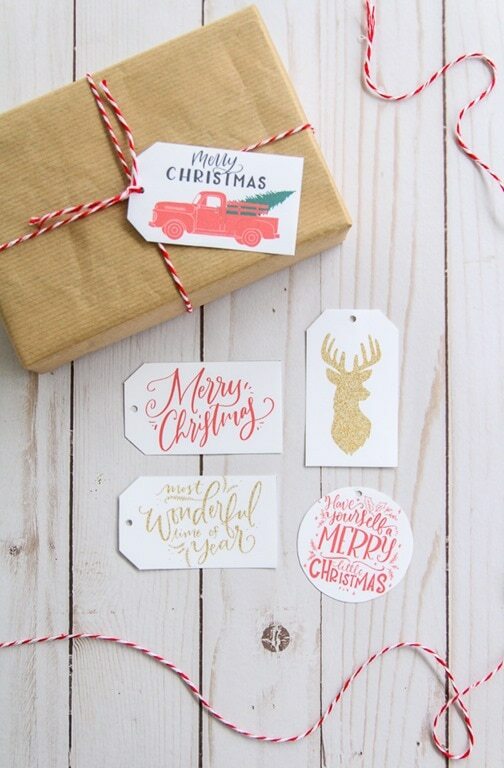 Free Printable Christmas Gift Tags for Simple Gift Wrapping - Lovely Etc. These free printable Christmas gift tags will add the perfect final touch to your gifts this year. Available in black, red, and gold glitter, they make wrapping beautiful gifts simple. I’m super excited to share these new Christmas gift tags with you – these may be some of my favorite free printables yet. 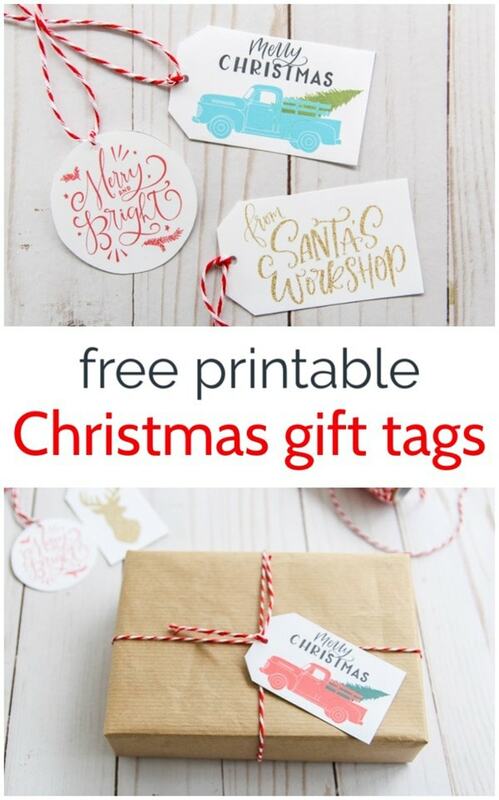 And you guys know I love to share the creative talent of others so I also invited 9 other bloggers to share their own free Christmas printables. There are wine tags, art prints, organizers, and more gift tags so be sure to check them out below. 1. Start with pretty wrapping paper. I will always have a soft spot for plain brown kraft paper but I like to mix in other papers as well. TJMaxx and HomeGoods are my go-to spots for great wrapping paper. 2. 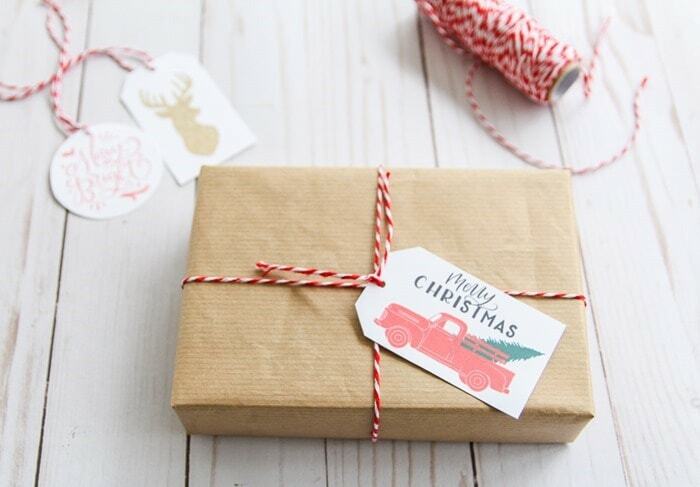 Wrap some bakers twine, rick-rack, ribbon, or chunky yarn around the gift. All of these are cheap, easy, and they don’t get smushed during travel like stick-on bows. 3. 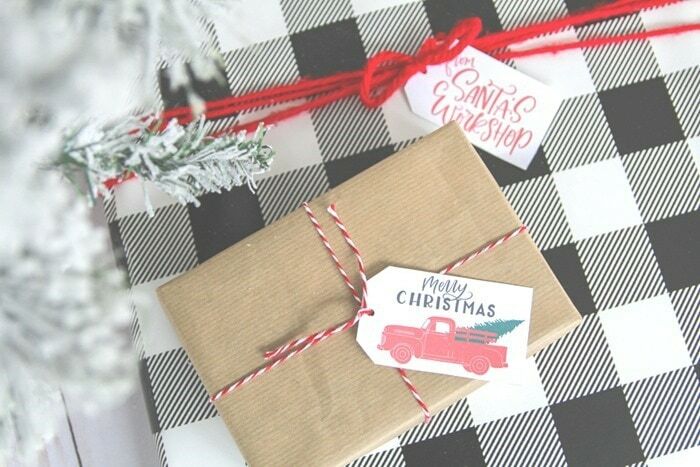 Finish it off by tying on a cute gift tag. This year I really wanted to try making my own gift tags and I love how they turned out. 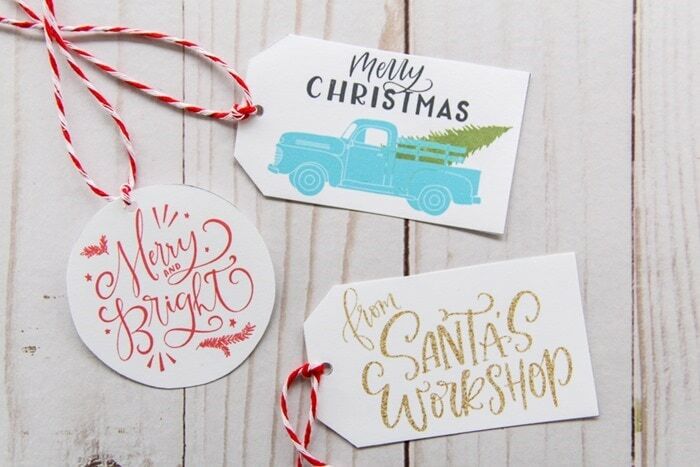 These printable gift tags are a little bit classic, a little bit farmhouse, and a little bit glam. I can never seem to stick to just one style for any project – and I’m ok with that. Who says we have to limit what we like to one label anyway? I’ve included several of my favorite holiday phrases and I couldn’t resist adding a deer silhouette and an old truck with a Christmas tree. I added the classic red truck and as well as a cute aqua truck. Because everything is better in aqua – especially vintage trucks! There are nine different designs in all and I made each of them in three different colors: red, black, and gold glitter. Between the three, you should be able to find the perfect tag for pretty much any gift! Just print them out on cardstock, punch a hole with a hole punch, and add whatever string your like. Red and white baker’s twine is my favorite for anything Christmasy but yarn or regular twine can also be festive. 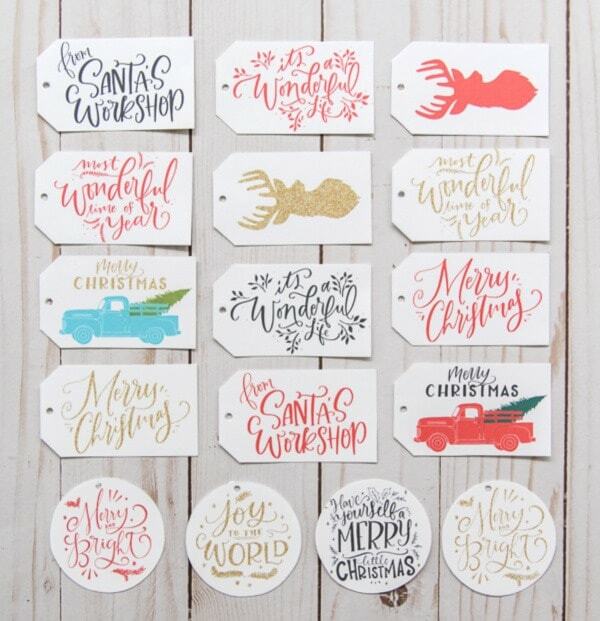 Ready to see even more gorgeous Christmas printables? Each one is absolutely free; just follow the links to snag your copy. Your gift tags are SO fun and festive, Carrie. Thanks for sharing a putting this round up together. Thank you Meegan! 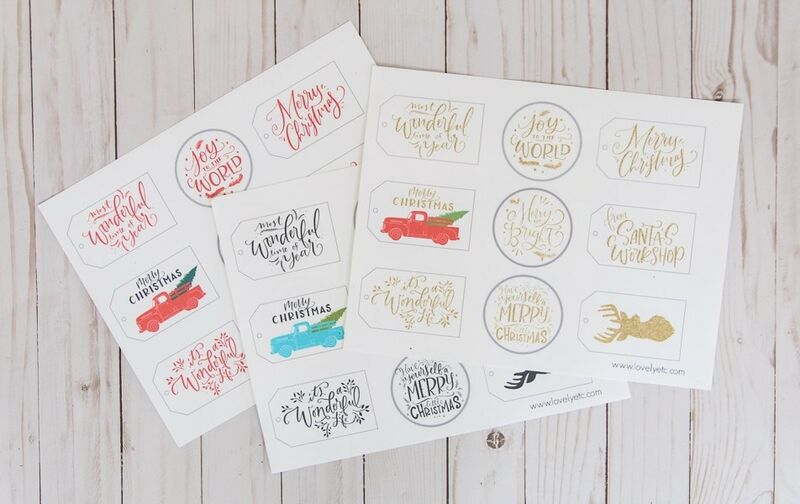 I have loved seeing everyone’s printables! Those are so cute! Thanks for hosting. Oh my gosh! How cute are those!! I love the truck one. :) Beautiful tags! Oh your gift tags are so cute and festive! I love them! Thanks for organizing this blog hop, Carrie! Thanks Tara! I am so glad you were able to join in! Oh my gosh, these are so great! And they look perfect with baker’s twine. Thanks so much for organizing another Christmas blog hop! Merry Christmas. Thank you Kathy! Baker’s twine is always the best at Christmas!